Please refer to our stock # 3501 when inquiring. 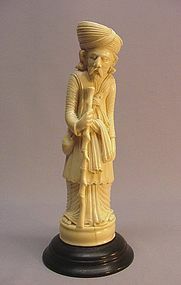 This very nice ivory carving of a traveling merchant is a 19th century product. It is 8” high (9” high with wood base) and, measured from the bottom, is 2 ¼” in diameter. This bare foot elder wears a turban and an old traditional (perhaps Afghan) robe. He has a sharp, wrinkled face; his hair is long and curly. He carries a soft cloth bag over his right shoulder; his right hand is holding a wood or bamboo stick. Aside from a few hair line cracks and one tiny chip on the bottom, it is in great condition.